Are you taking a fish oil supplement? If so, you are probably not taking prescription fish oil. Did you even know there is prescription fish oil, called Lovaza ? In large well-designed clinical trials, Lovaza has been shown to reduce death after previous heart attack and death in persons who have congestive heart failure. In another large study, done in Japan, high doses of a different fish oil supplement reduced vascular events in people with known coronary artery disease. At this time, Lovaza is only approved by the FDA to treat high levels of triglycerides in the blood. Triglycerides are a type of fat related to cholesterol. One third of Americans have borderline or high triglycerides in their blood. High triglycerides are associated with an increased risk of heart disease. And when triglycerides are especially high, above 750-1000 milligrams per deciliter, there is a higher risk of pancreatitis. Pancreatitis is a life threatening condition with inflammation in the pancreas. 4 Lovaza pills daily is the dose to lower triglycerides. 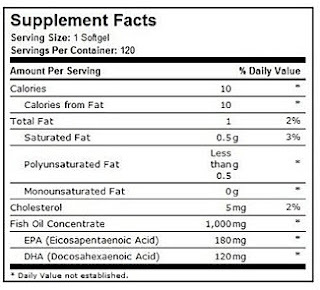 There are two active ingredients in fish oil; these are abbreviated EPA and DHA. Lovaza is a very concentrated preparation of fish oil that contains 900 mg. of these omega-3 fatty acids in each pill. But what if you don't take prescription fish oil? Most people who take a fish oil pill are taking dietary supplement, non-prescription, fish oil. Well, if you choose to take fish oil you would want at least 1000 milligrams (1 gram) of combined EPA and DHA daily. And if you are trying to get down your high triglycerides you need 4 grams daily of combined EPA and DHA. This label tells us that each pill with 1000 mg. of fish oil only contains only 300 milligrams of the active ingredients (EPA plus DHA is 180 + 120). That means you would need more than 3 pills to get 1000 milligrams (1 gram) of the stuff that works. And you would need more than 13 pills daily to get 4 grams. The point is: you must look at these labels because almost all the fish oil pills you will find for sale have on the front of the container “Fish Oil 1000mg” or “Omega-3 1000 milligrams”. But the label on the back tells you about the stuff that matters, the active ingredients, EPA and DHA. Tricky, isn’t it? Keep in mind that there are other possible benefits of fish oil other than those I mentioned above. But these have far weaker evidence. Now I’m not telling you to take a fish oil supplement. But if you do, you should know what you’re taking and why, whether it’s by prescription or not.